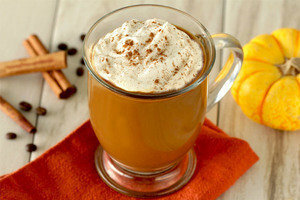 No list of pumpkin recipes would be complete without a DIY PSL! The original is loaded with sugary calories... Our version laughs in the face of such ludicrous stats. And we'll let you in on a little secret: We think ours tastes even better than the one at Starbucks. Try it and taste for yourself! Here we go! From petite portions to sliceable sweets, you’ll DEFINITELY get your pumpkin dessert fix here.